Stay organized and on-task. Customize your To-Do List, Grocery List, Chore List, Bucket List, Summer Kid List, Vacation Packing List, Medication List, Homework List, etc. etc. 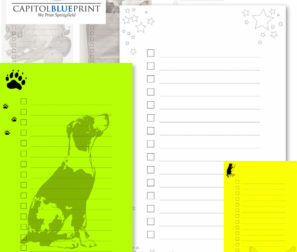 Customize your list items on our website or leave the lines blank to be filled in later. We will print the list and create notepads.